A video recorded by NASA's Solar Dynamics Observatory shows the two sun storms erupting from opposite sides of the star. Neither of the events posed a space weather threat to Earth or its satellites, NASA officials said. 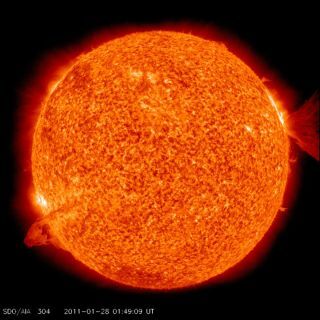 A still image released by NASA shows a filament — a long magnetic tendril of super-hot plasma — become unstable on the sun's left side (as seen by the SDO spacecraft). As the tendril snapped, it burst into a major solar eruption. Scientists measure solar flares according to a class system that includes three tiers. At the top of the list are X-class flares, which are major events that can trigger planetwide radio blackouts and long-lasting radiation storms, NASA officials have said. M-class flares, like the M-1 event observed today, are medium-size storms that can cause brief radio blackouts affecting Earth's polar regions, spurring minor radiation storms, they added. But none of those effects are expected from today's events, NASA officials said. "Neither event was headed towards Earth," officials with NASA's SDO mission said in a statement. The video recorded by the SDO spacecraft covers the period of time between Jan. 26 and Jan. 28. Several other flashes and burst of solar activity are also visible in the active region of the sun's right side, SDO officials said.